Doll & Em is a six part TV show that starts at 10pm on Tuesday 18th Feb on Sky Living. That’s everything you need to know to watch it so allow me to tell you why you should. 3. Friendship in the film industry. Emily Mortimer is Em, a British actor working in Hollywood. She is successful but is still looking for opportunities and occasionally suffers from self doubt in terms of her worth as a screen presence. She is sensitive, sometimes temperamental and convincingly and realistically human. Dolly Wells is Doll. Her relationship has broken down so she moves to the US to spend time with Em, her closest and oldest friend. She is fragile, sometimes selfish and totally and authentically human. Mortimer and Wells are clearly friends in real life and in playing versions of themselves they display a chemistry it is hard to fake. There have been any number of friendships depicted on screen but there have been few that show it this honestly. Of course the characters have their ups and downs but the affection they have for one another is totally genuine and it is this more than anything that makes the show so irresistible. I saw all six parts of the series when it previewed at last year’s London Film Festival. Interestingly, in the Q&A, the director Azazel Jacobs said they had chosen to make it as a TV show because they felt it would not work all run together as a film. This though is the format in which we saw it and at no point did it drag or come close to out staying its welcome. It wasn’t the promise of a realistic friendship that made it stand out in the festival brochure though. 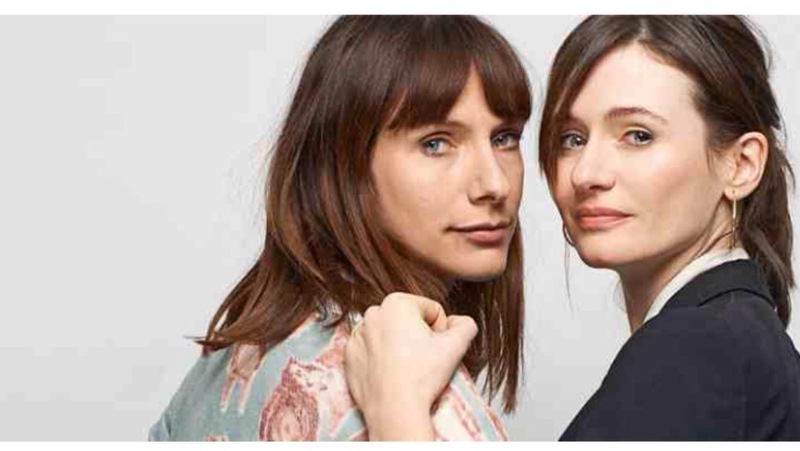 I’ll be honest, part of the draw was Emily Mortimer (we do love The Newsroom). She told me I was sweet during the Q&A which was nice of her. It was in response to a pretty sycophantic question on my part but that shouldn’t take anything away from the sentiment. As one of the originators of the show it is no surprise that the concept and execution plays to her strengths. She is by turns funny and infuriating, touching and (it seems only fair that I reciprocate) sweet. This is no one woman show though and the less known Dolly Wells is equally skilled playing perfectly against her. Incidentally Wells, like her co-star has a famous father; some time Denis Thatcher impersonator and comic actor John Wells. The main attraction of the program, and the thing that merits its mention on my blog, was the movieland setting. Obviously other shows have gone there before, from Entourage, Extras and Episodes to one off visits in things like Bones, The X-Files and Quantum Leap. The business they call show is not used for novelty value here though, it just feels like a story set in that world. They could have overplayed it but instead just show it in what feels like a more ordinary way. There are some celebrity cameos but they are either completely matter of fact or totally surreal which I would think are the normal extremes when dealing with incredibly famous people. What they are not is forced or gimmicky so think more Bill Murray in Zombieland and less Mike Tyson in The Hangover. Either way it feels like a little view into the life of one of us over there, someone a lot like Emily Mortimer. Interestingly the wonderful final episode leaves the American setting completely behind knowing that even if it was this that made you tune in, it wouldn’t be this that keeps you watching. Also, for what it’s worth, here is a show that has women as the central characters without having to portray them as super powered, over sexed, under sexed, Edwardian, nurses, teenage, spies, cops, gossip, Gilmore or golden so that makes a bit of a change. Don’t forget, Tuesday at 10. You’ll thank me.